Why roof replacement cost estimates differ? | Toronto roofing contractors - Smart RoofingSmart Roofing Inc.
Why Roof Replacement Cost Estimates Differ? There are many reasons why roof replacement cost estimates vary from one roofing contractor to another. These include the type of roof shingles used, what kind of roof warranty is included, and how the roof replacement work is being done. To properly compare the various roof replacement quotes you have received, make sure you know what the roofing contractors have included in their roof cost estimate. Roof shingles are available in numerous styles and types of construction that can affect their performance and longevity. Each type of roof shingle also comes with its own warranty coverage. Be aware of the warranty coverage included in the type of roof shingle you are choosing. For example, the warranty of some roof shingles may cover only defects that results in leak vs. roof shingle warranties that includes coverage from any type of defect, including aesthetic defects. Also know whether the manufacturer’s warranty only includes roofing materials or whether it includes the labour to replace the roof shingles. Click here to learn more about the different types of roof warranty available. Roof shingles are sold in bundles, but roofs are measured in “squares”. Three bundles equal one square. A professional roofer will usually quote a firm price based on the number of “squares” needed to cover the roof. They measure the roof before quoting a price and the number of squares does not change. This ability is what makes them a professional. Estimates that are not firm can be based on the amount of potential damage to the sheathing beneath the roof shingles. This can only be discovered when the old shingles have been removed. Other low estimates are often based on placing the new shingles directly over the old roof shingles. The old shingles should usually always be removed. 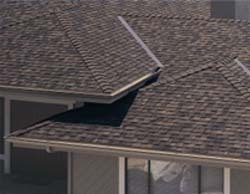 Installing new roof shingles over old ones can lead to premature failure and possibly void the manufacturer’s warranty. Many owners are not made aware by non-professional roofers of this option. These roofers seldom offer a warranty on their work and instead extol the virtues of the manufacturer warranty. The money saved by using them is quickly lost when problems occur. Uninsured non-professionals are always able to offer a lower price for installing roof shingles. Unfortunately, they usually charge about the same as professionals while performing substandard work without a reliable warranty. 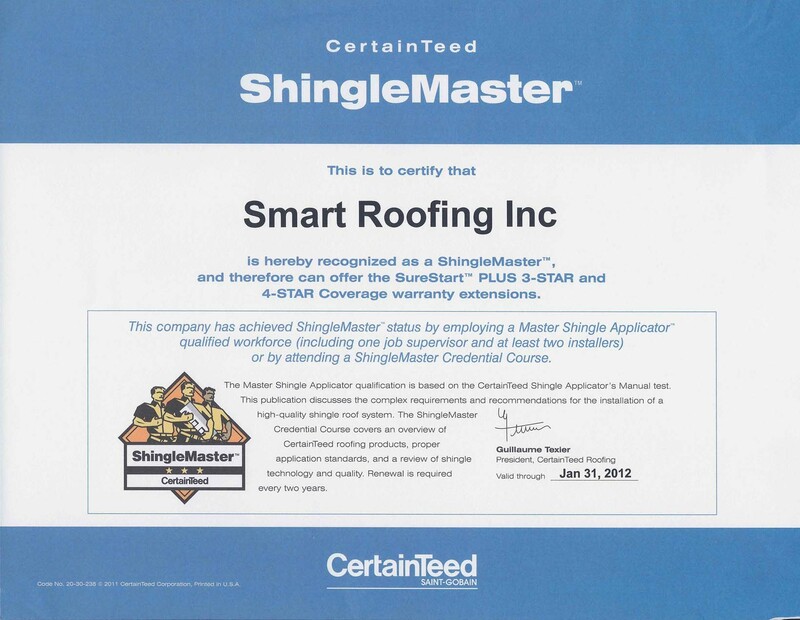 Installing roof shingles without the guidance of a licensed professional roofing contractor leaves the buyer to fend for themselves if warranty work is needed. Another problem owners often discover is insurance companies may refuse to pay for a weather-damaged roof if a licensed roofer did not install it. Smart Roofing only use high quality materials backed by industry-leading roof suppliers and quality workmanship. Our Integrity Roof System covers all of your installed products, including non-prorated coverage, roofing materials and labour and tear-off. 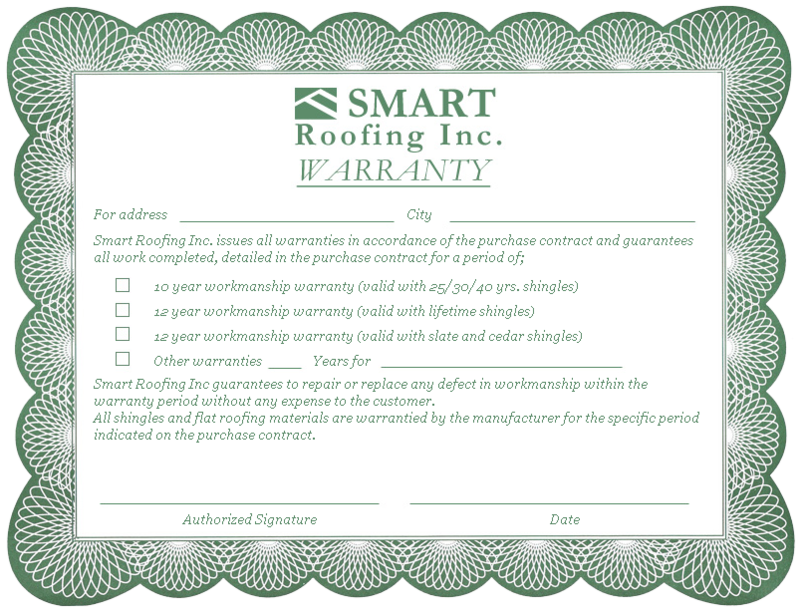 Once we have replaced your roof, we also provide you with proper roof warranty documentation. In addition, Smart Roofing complies with the WSIB and have $2 million in liability insurance to ensure you and your home are protected in the event something goes wrong. If you have any questions, concerns or would like to receive additional information, you are welcome to visit our roof shingles showroom or call us at (905) 361-9900 or Toll Free 1-855-416-ROOF. 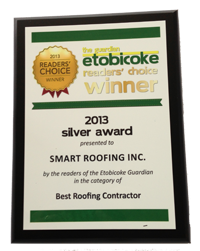 Smart Roofing is a residential and commercial roofing company that serves Toronto, Mississauga and the surrounding area. We take a system-based approach to providing you a quality a long-lasting roof. More than just a roofing company, our experienced team of certified roofers looks at the entire roof system, including eavestrough, siding and attic ventilation to ensure your home performs at peak efficiency. We offer 100% satisfaction guarantee and full service warranties.